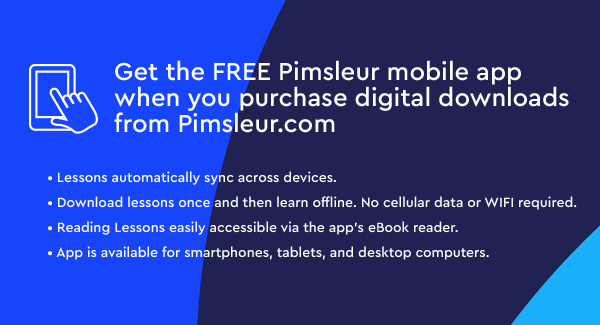 Pimsleur includes 30, 30-minute audio lessons, reading instruction, and culture notes as streaming or audio download, plus an integrated Reading Booklet. 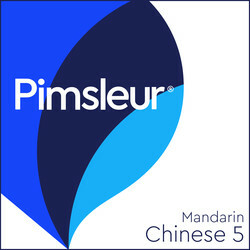 Builds upon skills taught in Pimsleur’s Mandarin Chinese Levels 1, 2, 3, and 4. The thirty 30-minute lessons, plus pinyin and select hànzì characters reading practice, will enable you to speak and understand Mandarin with near fluency and with a broad range of conversational skills. In Level 5, the pace and conversation moves quite rapidly, accelerating exposure to new vocabulary and structures, approaching native speed and comprehension. 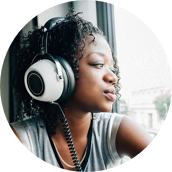 You’ll learn to speak more in-depth about your personal life and emotional state, and be able to create complex sentences using a mix of tenses and moods. • Food and drink: restaurants, street vendors, favorite dishes, delicious drinks, discussing differences between Chinese and American diets. Reading lessons introduce reading select hànzì, the characters used in the Chinese writing system. These lessons are designed to deepen your memory and understanding of learned vocabulary, as well as to begin the work of connecting the words and phrases that you have learned to the hànzì characters.